The Pizza Cultura book is now Available!! Come to the Chamber and get your copy for only $30 + hst. Our Address is 622 College Street, suite 201F, Toronto ON M6G 1B4. Contact us on www.italchambers.ca for more details. It’s been quite a month for artisanal pizza maker Franco Pepe. On July 10, at the Savoia Hotel Regency in Bologna, he had the opportunity to prepare an official G7 dinner hosted by Italy’s minster of the environment. Then, two weeks later, his now-famous Pepe in Grani in Caiazzo, a small town in the province of Cassette, was named Italy’s top pizzeria by a group of leading Italian journalists. So we are honoured that Franco found time in his busy schedule to share his personal story, in an interview for our upcoming book, Pizza Cultura. The son of a pizzaiolo and grandson of a baker, Franco sees his work as a continuation of a family project dating back to the 1930s. 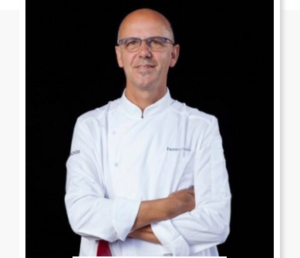 But at the same time his is a highly personal journey, which is why he chose to leave the family pizzeria in 2011 and pursue his own vision through Pepe in Grani. The unique facility, housed in a refurbished seventeenth century palazzo, is part pizzeria, part laboratory, and part hotel. Here Franco brings his concept of “wireless pizza” to life – making dough by hand for up to 800 people a night, without the use of electricity. And he often conducts tours of the area, bringing visitors from afar to visit the local producers he works with so closely. Franco’s story is an inspiration on many levels. The revitalization of an abandoned town and a scandalized province. The reinvigorating of local agriculture. The rediscovery and experimentation with ancient varietals in his search for a buona e sana (good and healthy) pizza. Franco says that when he started Pepe in Grani he wanted to “put the territory on his pizza.” And six years later his remarkable success is a resounding endorsement of his approach. We look forward to sharing his full story with you with the launch of Pizza Cultura this fall. 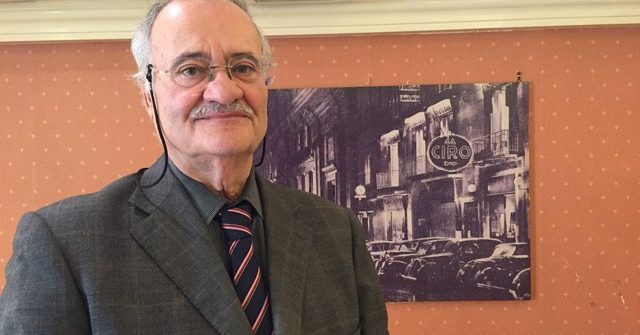 On July 14 we had to the pleasure of speaking with one of the co-founders of the Associazione Verace Pizza Napoletana (AVPN), Antonio Pace.Mr Pace’s family have been in the pizza business in Naples for two centuries, and in addition to his role as president of the the AVPN he also oversees the management of the family pizzeria, Ciro a Santa Brigida. “The association started with the 17 oldest pizzeria families in Naples, who we managed to bring together in the early 1980s,” he says. They came together along with a notary to try and hash out a definition of pizza napoletana in response to the growing popularity (and frequent misuse) of the term outside of Naples. “Until that time pizzerias were almost exclusively in Naples, even in Italy,” says Pace. “Imagine back in the 1950s, there were 6 or 7 pizzerias outside of Naples in Italy. By the early 1980s there 2,500. But everyone did it their own way, there was no respect for the rules. The important thing was to get consensus on the recipe from the old pizzerias. The recipe they came up with was simple and practical. Despite criticism from many of their fellow napoletani the AVPN persevered with their initial attempt to define pizza napoletana and have been successful in their goal of spreading it across the world. In 2009 the APVN successfully lobbied the EU to win certified status for pizza napoletana. Today there are APVN members on five continents and in 38 countries The APVN also runs training programs for pizzaioli at their home base in Naples and though satellite locations in the US, Japan and Australia.